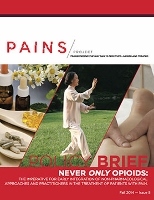 A new Policy Brief from a national campaign involving over three dozen pain-related organizations, Pain Action Alliance to Implement a National Strategy (PAINS) urges a major shift in pain treatment in the United States. "The imperative for incorporating non-pharmacologic, integrative approaches and practitioners into U.S. military medicine has been accepted and championed by former US Army Surgeon General Eric Schoomaker, and others," states lead author Martha Menard, PhD, CMT. Menard chairs the Task Force on Integrative Pain Care of the Academic Consortium for Complementary and Alternative Health Care (ACCAHC), which wrote the document. She clarified: "Our team examined the U.S. civilian population and found overwhelming evidence that a parallel imperative exists." The eight-page policy document is entitled Never Only Opioids: The Imperative for Early Integration of Non-Pharmacological Approaches and Practitioners in the Treatment of Patients with Pain. The case in Never Only Opioids rests on two foundations. One is the morbidity and mortality data that some have called an "opioid epidemic." The second is the growing research supporting the effectiveness of multiple integrative heath practices and practitioners. Co-author and ACCAHC Task Force member Heather Tick, MD, who holds an endowed professorship in integrative pain treatment at the University of Washington School of Medicine, states that it is "long past time that pain treatment stop viewing these complementary and integrative approaches and practitioners as, if anything, a last resort. The evidence is there for a massive shift in pain treatment now." The paper came with a two-page handout with Recommendations for various stakeholders. The ACCAHC work on the Never Only Opioids paper was partically funded through an unrestricted grant from the NCMIC Foundation. Comment: I was part of the team - that also included acupuncturist Arya Nielsen, PhD, Ac, chiropractor Bill Meeker, DC, MPH, and naturopathic physician Kevin Wilson, ND - that developed this brief. I was not certain that such a radical re-positioning of integrative therapies and practitioners from the basement of "when all else fails" to "early use" would go over in an initiative sponsored by an organization, Center for Practical Bioethics, that has had significant pharma funding. Menard, who sits on the PAINS Steering Committee as an ACCAHC representative, was more certain that the evidence would speak for itself. She was right. We hope this proves a good tool, and change agent. Former Army Surgeon General Schoomaker: The Two Reasons There is an "Imperative" for Integrative Health and Medicine in the Civilian Care in the U.S. In a keynote presentation at a September 29, 2014 policy day at Georgetown Conference Center to honor retiring US Senator Tom Harkin, former US Army Surgeon General Eric Schoomaker, MD, PhD provided a useful response to a query. In May, at the International Research Congress on Integrative Medicine and Health, Schoomaker had used his keynote to address what he called the "imperative" for integrative medicine in the U.S. military. The question to Schoomaker: Did he believe a similar urgency existed in bringing integrative health and medicine into all of U.S. healthcare? Schoomaker, credited with a major role in the military's proactive engagement with integrative care, answered affirmatively. He cited two reasons. First, he cited statistics in the civilian population to conclude that show that the trail of morbidity and mortality from overuse and abuse of opioids and other pain killers is similarly epidemic. Second, Schoomaker pointed to the necessity, from the perspective of national security that the United States to begin to focus on creating a culture of health and wellness. He cited the challenge the military has in filling its ranks due to disqualification of overweight and obese applicants. Schoomaker concludes that there is in fact an imperative that the values, practices and professionals associated with non-pharmacological integrative health and medicine be rapidly up-taken into the U.S. medical industry. Comment: It is time for a leader in the civilian world to step up and make a similar, courageous call, as Schoomaker has done, for proactive exploration now! The document noted in the article above, Never Only Opioids, provides a policy case. Who will it be? Participate! IHPC Urges Support of HR 4887, "Expanding Care for Veteran's Act"
The Integrative Healthcare Policy Consortium (IHPC) is going to bat for veterans. In a late September mailing to members, IHPC urged them to message respective congressional representatives encouraging them to support HR 4887, "Expanding Care for Veterans Act." The bill provides for research, education and the delivery of complementary and alternative medicine services for veterans. According to the e-letter, HR 4887, spear-headed by Representative Julia Brownlee (D-CA), would mandate that the Veterans Administration (VA) conduct research while developing a plan that includes complementary and integrative approaches over a three year period to assess the "feasibility and advisability of integrating CAM with other health care services" provided by VA medical centers. The IHPC provides this link for responding. By US Senate Resolution 420, the United States Senate declared October 6th through 12th as Naturopathic Medicine Week. More valuable than the recognition of the week for the American Association of Naturopathic Physicians (AANP), the promoter of the initiative, is what the Senate said. The language on the unanimous vote notes simply that the resolution "recognizes the value of naturopathic medicine in providing safe, effective, and affordable health care." The profession is credited with providing "noninvasive, holistic treatments that support the inherent self-healing capacity of the human body and encourage self-responsibility in health care." The lavished praise does not stop there: "Naturopathic medicine focuses on patient-centered care, the prevention of chronic illnesses, and early intervention in the treatment of chronic illnesses." The prime sponsor of SR 420 is Barbara Mikulski (D-MD), with other endorsement from her US Senate Appropriations Committee colleague Tom Harkin (D-Iowa). In addition, this year the AANP picked up the support of their first Republican, in Sen. Kelly Ayotte (NH), and also that of Independent, Angus King (ME). Comment: Who needs Madison Avenue when you have the U.S. Senate sending such messages? This is a ringing endorsement. For a small and still largely unknown profession, these comments from this "third party" should be plastered everywhere. While policy advances for complementary and alternative medicine are famous for their grassroots consumer advocacy, this column in the Huffington Post makes the case that one individual stands out above all others for his immeasurable contributions: U.S. Senator Tom Harkin (D-Iowa). Harkin slipped language into a 1991 appropriations bill to begin the National Institutes of Health exploration of "unconventional medicine." He authored the 1998 mandate giving it independence as the National Center for Complementary and Alternative Medicine, then slowly upped its annual budget to over $125-million. Through another deft maneuver from his position as chair of the powerful US Senate Appropriations subcommittee that oversees, among other things, U.S. Department of Health and Human Services, Harkin funded the 2001 White House Commission on Complementary and Alternative Medicine Policy. Most recently, he inserted complementary and integrative practices into numerous places in the Affordable Care Act. Included is the powerful Section 2706, "Non-Discrimination in Health Care," for which Harkin has gone to battle with HHS on that agency's failure to respect Congressional intent. Through it all, he has used his bully pulpit to decry the limits of what he calls our "sick care" industry and to promote his vision of us making of the United States "a wellness society." Comment: People more experienced in understanding woo-woo than I are needed to explain how it is that our grossly under-funded movement for integrative health and medicine -- and for Harkin's "wellness society" - found a champion with such political power and appropriations clout. Imagine what the last 20 years might have been if a buddy of one of the "polarization-based medicine" (a.k.a. sciencebasedmedicine.com) bloggers had hunkered down into that role on the Appropriations Committee in 1991? I am not a big adherent to the Great Man theory of history, but Harkin is in that category for our fields his visionary promotion of system change. The good news is that his very close colleague in advancing our movement, Barbara Mikulski (D-Maryland), is now the U.S.' third most powerful elected official, as chair of the U.S. Senate Appropriation Committee. And Harkin told an audience celebrating his work at a September 29, 2014 event at Georgetown University that his passion for wellness and integrative care will be among his core interests from his post-Senate involvement with the Harkin Institute for Public Policy and Citizen Engagement at Drake University. "If we can show that we have better outcomes and it's cheaper to take a functional approach, in the end, the doctors who adopt this model-and their patients-they will be the ones who win." This is Institute for Functional Medicine (IFM) president Mark Hyman, MD, in an article in the widely read political blog The Daily Beast in June 2014 in which he mentioned that he was working with the Cleveland Clinic to create a program in functional medicine. On September 15, 2014, an article in Crain's Cleveland Business propelled news of the program nationally. The highly-regarded Cleveland Clinic is not merely dabbling in the field but entering a full partnership with IFM, according to the release from the Cleveland Clinic. IFM's chief medical officer Patrick Hanaway, MD will be on the ground in Cleveland with author Hyman also serving in leadership. The Crain's article notes a strong research focus in the partnership: "Plans for the center include four clinical trials focusing on the treatment of asthma, inflammatory bowel disease, type 2 diabetes and migraines." Cleveland Clinic CEO Toby Cosgrove, MD said the new center is "not a departure for Cleveland Clinic, but a continuation of the innovative, holistic approach that we have embraced." The initiative is examined in this Huffington Post piece. Comments: Integrator editorial Adviser Sabin and I share extensive comments on his FON Therapeutics site where I first posted on this topic, at Sabin's invitation, with many captured in this Huffington Post piece noted above that I subsequently filed. They circle around the pricey office fees, tests and supplements of many functional medicine practices, and question the fit in the Cleveland Clinic environment. What will this clinical and business model look like? The Huffington Post piece includes an excellent comment from the Institute of Functional Medicine that speaks to this question. When the Samueli Institute pieced together the cost document to support its Wellness Initiative for the Nation (WIN), it cited the AMI Group's incredible outcomes from an integrative primary care network contracted with BCBS's HMO Illinois. Integrative chronic pain pioneers seeking model projects for the underserved may remember the outcomes from AMI's historic program with Florida Medicaid. In a recent interview for this article, co-founder Richard Sarnat, MD, an ophthalmologist turned integrative primary care physician with a 40 year meditation and Tai Chi practice, shared that the AMI "continues to enjoy small victories" in its work to prove that cost savings can come with patient-centered care via well-structured integrative practices. Sarnat offered a quick update on the firm's business. AMI's Illinois integrative primary care network was just one of very few independent practitioner associations selected for expansion into the continued business options offered by Illinois Blue Cross Shield's HMO post implementation of the Affordable Care Act. HMO Illinois enrollment has seen a "15% to 20% uptick in volume" post ACA. Almost 3 years ago, legislation in Rhode Island led to selection of AMI to deliver an integrative chronic pain program for the Medicaid population there. In Rhode Island, the firm is working closely with United Health Care, that firm's behavior health providers, as well as Neighborhood Health Plans (NHP). Like the former Florida program, the Rhode Island initiative is built around holistic nurses with mind-body skills, tools and a model that allows them more time with each client. They collaborate with local primary care networks, plus massage therapists, acupuncturists, chiropractors and nutritionists. AMI also has added newer business in Idaho, and continues with a core contract for managed chiropractic services, forged with the Maryland Chiropractic Association, that reaches into Washington, D.C. and Virginia. Adds Sarnat: "We're increasingly a technology company, building our own data informatics platforms in order to generate the variety of outcomes reports that clients are now interested in." Speaking to the importance of generating outcomes: "We were into the idea of big data before anyone called it "big data." Disclosure: AMI was an Integrator sponsor from 2008-2011. The model is "embedded," according to Aditi Nerurkar, MD, MPH, assistant medical director with the Chen-Tsui Integrated Care Center at Beth Israel Deaconness Medical Center of the Harvard Medical School. In an e-correspondence, Nerurkar noted that among the "differentiators" for the Center are that it is: within a primary care setting within an academic medical center; all providers are "vetted by the primary care practice administration;" and all Chen-Tsui practitioners "write notes within the electronic medical record (EMR), and loop back to the referring physician." The service includes: acupuncture, massage, nutrition services - the most frequently offered - and also yoga, Tai chi, Mindfulness-Based Stress Reduction, and exercise. According to data shared by Nerurkar, 73% of patients are female with the average age of the served population 56. She notes that the primary care practice, Health Care Associates, is "moving towards a PCMH model." In addition, it is part of the Harvard Pioneer Accountable Care Organization and engaged in the major initiative to redesign primary care through the Center for Primary Care at Harvard. Kim Ariyabuddhiphongs, MD serves as Chen-Tsui's medical director. Comment: The service is as yet young, with only 85 patients, for instance, seen for acupuncture since the beginning of 2013. Yet at the same time, with the EMR, the potential for data collection and dissemination is significant. Here's hoping this Center becomes a learning opportunity for all of us. The National Center for Complementary and Alternative Medicine (NCCAM) announced on September 25, 2014 that it has engaged a $21.7-million program to "address pain and related conditions in U.S. military personnel, veterans, and their families." The 5-year program includes 13 research projects. According to the release, the "research will focus on nondrug approaches." Other funding came from the National Institute on Drug Abuse (NIDA) and the U.S. Department of Veterans Affairs (VA) Health Services Research and Development Division provided funding for this initiative. The release leans on a commentary, Pain and Opioids in the Military: We Must Do Better in JAMA Internal Medicine last June by former US Army Surgeon General Eric Schoomaker, MD, PhD and Samueli Institute CEO Wayne Jonas, MD. The 13 grants are all described in the release. One grantee for $718,000 is the Palmer Center for Chiropractic Research, led by Christine Goertz, DC, PhD. The study will look at how chiropractic care might be integrated with Veterans' clinical practice guidelines for veterans with a combination of musculoskeletal pain and mental health conditions. Comment: A person might have seen this coming. NCCAM director Josie Briggs, MD has stacked the National Advisory Council for Complementary Medicine with the likes of Schoomaker and Tracy Gaudet, MD, of the VA's office of Patient Centered Care and Cultural Transformation. Exciting work - that meshes well with the new policy brief noted above, Never Only Opioids: The Imperative for Early Integration of Non-Pharmacological Approaches and Practitioners in the Treatment of Patients with Pain. Arya Nielsen, PhD, Ac sent news that a team from the Albert Einstein College of Medicine scored. a $1.94-million, 3-year grant from the Patient Centered Outcomes Research Institute (PCORI) The project is called Acupuncture Approaches to Decrease Disparities in Outcomes of Pain Treatment- A Two Arm Comparative Effectiveness Trial (AADDOPT-2). The co-PIs are Ben Kligler, MD, MPH and Diane McKee, MD and their team includes Nielsen and Belinda Anderson, PhD, LAc. In their proposal they note reimbursement challenges for acupuncture that limit access and state: "Because group acupuncture can be offered at a lower cost, demonstrating that individual and group delivery are both effective could reduce barriers to use of this effective pain management approach. The research team will conduct a randomized comparative effectiveness study to assess outcomes of individual and group acupuncture for treatment of chronic pain." Comment: Kudos, first, for successfully being awarded the grant. Despite PCORI's specific charge to explore complementary and alternative medicine, only 4 prior awards focus in this area. (One issue may be a lack of submissions.) Kudos #2 for this great study idea. Alignment of interest bias: I have found group acupuncture to be immensely useful, personally, and in fact prefer it to one-and-one. Is there something of value to being in a group, rather than solo, especially with a health issue as subjective as pain? That would be a different research question. Great team! Looking forward already to the results. Michele Mittelman, RN, MPH, the cofounder and power behind the scene of the most intriguing journal to emerge in the integrative health and medicine space recently, Global Advances in Health and Medicine (GAHM), has announced the hiring of a new editorial and leadership team with whom she will be working in setting the magazine's direction. It's a powerful nurse/medical doctor duo: Mary Jo Kreitzer, RN, PhD, FAAN, the founding and longtime director of the Center for Spirituality and Healing at the University of Minnesota; and Robert Saper, MD, MPH, director of The Program for Integrative Medicine and Health Care Disparities at Boston Medical Center and associate professor of Family Medicine at Boston University School of Medicine. Additionally, Avery Stirratt has joined the team as president and publisher. Krietzer, a former vice chair of the Consortium of Academic Health Centers for Integrative Medicine (CAHCIM), as well as a Council of Advisers member of the Academic Consortium for Complementary and Alternative Health Care, is the most significant nurse leader in integrative health and medicine. She has a passion for community and public health, health creation, and coaching. Saper is viewed as one of the standout emerging leaders of CAHCIM. He will chair the organizing of the 2016 iteration of the International Research Congress on Integrative Medicine and Health. Stirratt is a senior media executive with 25 years' management experience with a wide range of companies, from iconic brands (Forbes, Newsweek) to foundations and new business ventures. Mittelman shared with the Integrator that she is excited to see the journal's interprofessional mission reflected at the top. She envisions the journal as a comprehensive communication platform that will advance health and well-being around the globe. The new editorial team replaces David Riley, MD, who resigned last spring. Comment: Many assumed that when Riley, GAHM's founding editor, left the journal that it would collapse. They underestimated Mittelman and the power of her vision and partnership in creating GAHM as it is today. I am a big fan of GAHM's three ongoing priorities, set in Riley's term: global convergences in health and medicine, whole systems approaches in healthcare, and high-quality case reports. What's not to love in that? Riley led some fine work, particularly in the remarkable case reports area, and in turning out some exceptional, focused issues. I am very curious to see where the Kreitzer-Saper-Stirrat team, working with Mittelman, will take the journal next. Explore Commentary: Is there a "Town and Gown" Split Related to Science and Evidence in Integrative Medicine? "Evidence based medicine...evidence-informed practice...patient-centered care...the art of medicine...These terms fly around the landscape of integrative health and medicine with the potential to ultimately generate a meaningful consensus and a shared language for how we discuss clinical decision-making and clinical practice. But more often than not the discussion around evidence and knowing degenerates into a Tower of Babel." This is the opening of a commentary in Explore co-authored by Ben Kligler, MD, MPH, a past chair of the Consortium of Academic Health Centers for Integrative Medicine, and this writer, entitled Finding a Common Language: Resolving the Town and Gown Tension in Moving Toward Evidence-Informed Practice. The perspective explores the mixed views of research and evidence as cited in "gown" (academic medicine) and "town" (practice-driven functional, naturopathic and integrative conferences and texts). How do we explain decrees that there is "none or limited evidence" from the National Institutes of Health about something on which one has just received a hand-out with 150 scientific references? The authors explore the cultural-economic-scientific rift that has led to differing uses of evidence. For instance, "town" dwellers may speak about in vitro studies as though they prove something in vivo. Meanwhile, "gown" oriented academics, who may be over-critical about such an infraction in application of science, may have little appreciation that they are daily reimbursed for treatments for which only a small fraction have quality evidence. The authors make the following recommendations. First, embrace mixed methods research to better capture whole person outcomes. Second: promote case reports "as a legitimate means to accumulate new clinical knowledge." The final recommendation is, according to the authors, recognized as a challenge for those who "hide behind the notion that every question can ultimately be answered with randomized clinical trials." In fact, "there will always be many answers only available to us through intuition, experience, and patient-centered communication." The kicker: "... as of this moment we hide this from our students and residents." All parties "need to be open and honest about how much of even our own type of practice is based on not knowing what evidence has to say." Comment from Ryan Bradley, ND, MPH: "My overall response to your editorial is positive. I think you two do a good job of being humble and bring needed light to the issue of evidence limitations in all categories of practice. Ironically in all settings ego and ‘status quo' practices, based on history and not evidence, often win out over the art of individualized practice, based on a balance between patient preferences, the available evidence and rational thought. "My friendly fire would be, the first several paragraphs appear to be very ‘stream of consciousness' and casually written. Also it takes over a page (of a two page editorial) to make your recommendations. I think your recommendations could be developed more, including how/where your suggestions apply in diverse practice settings, how they may specifically encourage integrative practices/cooperation between providers, and how to specifically encourage doctors/policy makers to accept broader perspectives on the evidence hierarchy. "For example, is a couplet of a prospective, quasi-experimental (1) and qualitative (2) studies evaluating patients' experiences with naturopathic care for diabetes, including evidence of improved blood glucose, improved self-management, increased medication adherence, increased self-efficacy, improved mood and overall complementarity to usual care, enough to incorporate naturopathy into conventional practice settings, or leverage the need for demonstration projects of integrative care teams for diabetes? It hasn't been enough yet, and I'd sure to know why not! ;)"
Comment: Bradley's final point is good: having the mixed methods research is not necessarily enough to get the ball of coverage and inclusion rolling. One his other commentary: far be it for me to argue that Bradley, or anyone else, has wrongly stated that I have ever been involved in using too many words or not being succinct enough. On September 10, 2014 the University of Minnesota's Center for Spirituality & Healing announced the launch of a unique Integrative Health & Wellbeing Research Program. Among the core faculty are two of the top researchers from institutions associated with the licensed integrative health and medicine fields, Gert Bronfort, DC, PhD and Roni Evans, DC, MS, PhD. Each were formerly with Northwestern Health Sciences University, from which they will transfer their current grants. They will be part of the first research core at the long-standing Center, headed by founder and director, Mary Jo Kreitzer, PhD, RN, FAAN. Kreitzer anticipates that "the team will investigate the biological, psychological, social, environmental, and other dimensions of mind-body and integrative therapies." the new program will use various modes of inquiry to explore the science of wellbeing from holistic, interdisciplinary, and collaborative perspectives. Pamela Jo Johnson, MPH, PhD fills out the research team. The program is partially funded by a $500,000 grant from the NCMIC Foundation. Lou Sportelli, DC, president of NCMIC Mutual Holding Company, explains that they found this venture "a fantastic opportunity to collaborate with a University whose innovative thinking is already eliminating the ‘barriers' to health and wellbeing through interdisciplinary cooperation in clinical and research programs. This is truly a 21st century innovative application to health and wellbeing, and so consistent with the chiropractic approach that the decision was really an easy one to make." Comment: This is a fascinating development. Among Kreitzer's distinguishing traits as a leader in the integrative health and medicine field is the linkage of a powerful and abiding, and respectful interprofessionalism with a constant eye on the prize of creating health and wellbeing. Powering that up with a core research team is terrific and the NCMIC Foundation's grant has brought her two of chiropractic's best researchers. Together these two attracted over $22-million of research funding to Northwestern. Yet excitement over the good that will come of the new Minnesota center is coupled with a shadow: a drain of some fine brains from the institutions that directly education the licensed integrative health practitioners, and the concurrent depletion of one of the top research programs in any institution associated with chiropractic and the other licensed integrative health disciplines. Is this part of a general trend toward giving up on developing research capacity inside such universities? If so, what happens to the research and evidence dialogue in institutions that aren't in the game? The ambitious Maryland University of Integrative Health is adding to a score of bachelors, Masters and certificate programs by offering not one, but a set of 3 doctoral level programs according to this release. These include First Professional Doctorate in Acupuncture (D.Ac. ), First Professional Doctorate in Oriental Medicine (D.O.M. ), and Doctor of Clinical Nutrition (D.C.N.). Judith Broida, PhD, MUIH's provost and executive VP of academic affairs explains: "Approval to offer terminal degrees in our unique disciplines has long been a dream of Maryland University of Integrative Health. This tremendous achievement is a testament to the vision of our leaders and the steadfast work of our faculty. These programs meet a growing market demand for scientific and compassionate healers in integrative health and MUIH is proud to be a national leader in offering them." Comment: It is no secret that MUIH is also looking at a fourth doctoral program. At the August 2014 conference of the American Association of Naturopathic Physicians, MUIH's top staff showed up to meet with academic leaders in naturopathic medicine from across the country. MUIH is examining of potential offering an additional doctorate in naturopathic medicine. Recent licensing of naturopathic doctors in Maryland opened the door. In an October 2, 2014 release, the Southwest College of Naturopathic Medicine (SCNM) pegged their record-setting influx of new students to the rising primary care crisis in the United States. A total of 97 students enrolled, from 26 states, British Columbia, Nova Scotia and Puerto Rico. Roughly 42% of the enrollees are from Arizona. SCNM, which opened its doors in 1993, graduates 82 students in July, also an SCNM record, bringing the total number of graduates to 1,171 since SCNM opened in 1993. SCNM president Paul Mittman, ND, EdD, notes that the school received over 8,000 inquiries last year. He notes that this level of interest "coincides with the growing interest in incorporating complementary and alternative medicine in overall healthcare and wellness programs." Mike Jawer, the director of government relations with the American Association of Naturopathic Physicians (AANP) shares that the AANP along with the Integrative Medicine Consortium and the Alliance for Natural Health have each submitted comments to the FDA States Jawer: "It's a complicated issue but the stakes are high - namely, the continued availability of compounded drugs - especially as dispensed for patients in the office." In a notice to members, the AANP stated that via "a collaboration with McGuff, a well-respected compounding firm that has been very active on this issue, our ND volunteers documented the clinical need for 43 ingredients that are essential in the compounded drugs that naturopathic patients are treated with." The AANP asked for additional time to fulfill on the burdensome application requirements to document the clinical need for another large group of ingredients. Education and Training Solutions co-founder Jan Schwartz, MA, BCTMB, was honored by the Massage Therapy Foundation with a Distinguished Service Award. Schwartz' roles for the massage field have been many. She was chair of the Commission on Massage Therapy Accreditation during a period of robust activity. She served as vice president for education with Cortiva Institute when they were consolidating massage schools. As an interprofessional leader, Schwartz became a founding member and the core massage presence on the Academic Consortium for Complementary and Alternative Health Care (ACCAHC) where for 5 years she co-chaired the Education Working Group. She was a leader in the program committee in the breakthrough International Congress for Educators in Complementary and Integrative Medicine. She teaches business at a Tucson acupuncture school. Her service includes a stint on the MTF board of directors and an ongoing role in providing online education with the gigantic Massage Envy, and others, through her Education and Training Solutions. Comment: What a well-deserved award! For a decade I have leaned on Schwartz to educate me with her balanced perspectives on the sometimes turbulent ins-and-outs of the massage field, and to draw quality individuals to our work together in ACCAHC. My vote was in a long time ago on this one. A "Twin Cities Women Leaders" event on September 16, 2014 honored 84 of the most powerful and influential leaders in the Twin Cities area. One was Mary Jo Kreitzer, RN, PhD, FAAN, the founder and director of the Center for Spirituality and Healing at the University of Minnesota. The event was sponsored by the George Family Foundation. In a press release on the event, Penny George, president of the foundation, states: "We are pleased to honor Dr. Mary Jo Kreitzer for her leadership and contributions to our community. I find it immensely gratifying the number of talented women who have led the Twin Cities in building institutions and solving significant social problems." The full list and a photo of those honored is here, with Kreitzer third from the right, first row, next to the Georges.